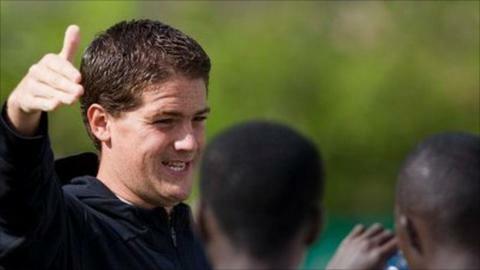 An unknown Norhern Irishman Johnny McKinstry has been installed as caretaker coach of Sierra Leone. He replaces Sweden's Lars Olof Mattsson who resigned a few weeks ago. McKinstry's appointment came after a meeting between the Sierra Leone FA and officials from the sports ministry. The Northern Irishman - who has no previous coaching experience in Africa - will be in charge of the Leone Stars' remaining 2014 World Cup qualifiers. Former Sierra Leone Mohamed Kallon is surprised at the choice of coach for the Leone Stars. According to the Sierra Leone FA, he will be considered for the job on a permanent basis if he does well against Tunisia, Cape Verde and Equatorial Guinea. Acting director of sports Alphan Coker said: "We decided to appoint McKinstry because he has a good CV and understands Sierra Leone football as he's been in the country for a while now. "We believe he's a good choice." Although he is not an established coach, he has been working at the Craig Bellamy Foundation which runs a football academy in Freetown. He holds a Uefa 'A' coaching licence and has worked for the Irish FA, English Premier League club Newcastle United and the Major League Soccer team New York Red Bulls. McKinstry will be assisted by former Sierra Leonean international John Keister and goalkeeping coach Tamba Moses. Former Sierra Leone and Inter Milan striker Mohamed Kallon said he was "really, really surprised" by McKinstry's appointment. He told BBC Sport: "If we are not looking for a home-based or local coach, then we should have gone for a Class A coach who has working experience with national teams or clubs in Europe. "But I will not rule [McKinstry] out, because I don't know him and I have never seen him coaching. We just have to wish him the best of luck."